.. watching him sleeping before you go to work..
or taking a walk after work..
..to treat your loved ones with the food they love..
or maybe one piece of chocolate cake can make you happy! Let's have some fun in the kitchen! Ready??? You choose any of these recipes and I'll help you! Everybody loves zucchini except Aria! A good recipe for zucchini with simple on-hand ingredients. the recipe earlier you might want to use it now. so, I didn't use more sauce or tomato though. But if you like it in more tomato, just scoop more sauce, less chicken broth in it! Add half moon sliced zucchinis to the pot..
..salt n pepper and finally dry mint! Some leftover zuccini and bulgur was my last night dinner. How to make Eggplant Bulgur Pilaf ? You combined the diced tomateos and the tomato paste, right? Cook a few minutes more..until tomatoes soft. Ok, well it's time to add bulgur and boiled water. Don't forget to salt n pepper!! Sprinkled with spicy chicken mix and grilled! Hmm...yummy Arugula Salad with grated tomato sauce. and added grated tomato to the sauce. Especially ideal for summer time! Beat yoğurt; mix with garlic, salt and water. 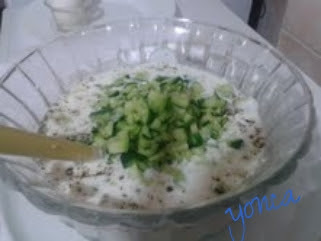 Pour the yoğurt mixture over cucumbers. You might prefer peel cucumbers but I don't..
Drizlle vinegar and olive oil. Stuffed wine leaves are very common. Pictured just after placed into pot before cook it! Colorful bell peppers are also pereferable. Mmmm..beautiful color combinition on the plate!!! 11 adet cubanelles(I have small ones. clean out the seeds inside. Now, the peppers are ready! Mix all the ingredients and stuff the peppers with a teaspoon. The rice will need some room to expand during cooking. Fill the pot half way up with hot water. and cook them until rice is soft. Have a tasteful weekend !